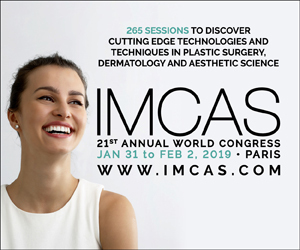 IMCAS returns to Paris, France to host the 21st edition of IMCAS Annual World Congress at the Palais des Congrès from 31 January to 2 February 2019. With an expectant number of 10,000 international delegates and over 700 speakers, this edition offers 265 educational sessions on the latest advancements in research and technology in the fields of dermatology, plastic surgery and aesthetic science. the congress, aims to improve your competencies and skills in assessing the implications of the latest research and treatment methods. International dermatologists will share their expertise in the prevention and intervention of common dermatological pathologies such as acne, pigmentary diseases, skin cancer, scars and burns. Follow along as they discuss the efficacy of recent evidence based therapies and updated guidelines for diagnostic and therapy such as energy-based devices for specific diseases. This year also features for the first time, the Young Physicians Module where young dermatologists in their residency can receive focused trainings on diagnosis, early intervention, and basic treatment methods for melasma, scars and lasers. The 21st Annual World Congress expands not only in terms of content but also in terms of space, with exhibitions taking place on three floors. Be part of this extraordinary congress for all the newest tools to optimize your practice.